I bought a new camera recently and wanted to test it out with something fun. I’ve mentioned Sally Sampson’s new book, 100-Calorie Snack Cookbook, here before, and even though this recipe is one of Sally’s, it definitely doesn’t come from that book. I got the recipe from the equally fabulous The Bake Sale Cookbook, one of my go-to sources for impulse treats. I’m thrilled with the photos (and the new camera), and the recipe turned out fabulously. Here’s a little recap. Making the candy is easy — butter, sugar, and water — the trick is to stir, a lot. Towards the end the mixture gets dark pretty quickly, so pay close attention until the color looks just right and you won’t need to bother with a candy thermometer. 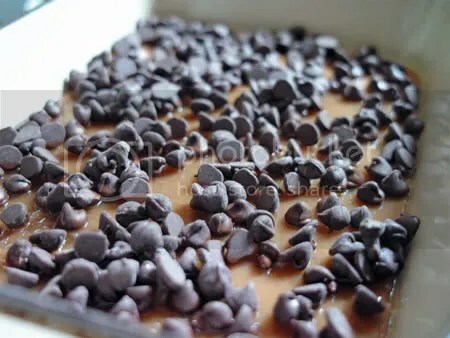 You pour the candy into a baking pan, and it cools pretty fast, so be sure to put the chocolate chips on top while it’s still warm. 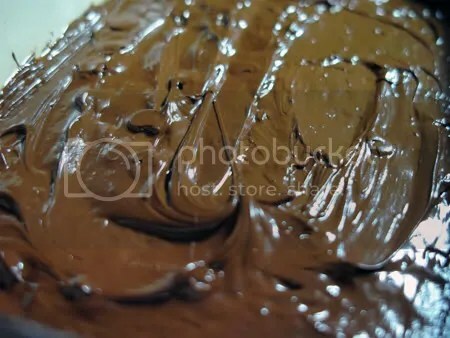 And then spread the chocolate once it starts to melt. YUM! Then put some toasted, chopped nuts on top and let everything harden. Anybody can do this, as long as you have a little patience. Then again, chocolate and patience do not always go hand-in-hand. Trust me though, it’s worth the wait. yay for a new camera! That looks fantastic, and so easy. I love that. For real, there is nothing better than homemade toffee. I make it periodically and people go absolutely nuts for it. Yours looks terrific! you’re right, dana. thanks for visiting. Ooooh, my sweet tooth is nagging at me. It wants this sooo badly. My waistline disagrees, but who listens to that body part, anyway?What type of camera did you get? I’m looking to upgrade myself. Oh my gosh….how good does that look!! I love toffee. Also, thanks for checking out my blog! wow. those are great pix! yum yum. I never knew toffee was that easy to make. I guess I won’t be buying the prepackaged kind anymore. Thanks. Nice job on the photos! Oh my gosh, YUM! Toffee is one of my faves. Your photos look great…so clear and yummy! You did well with your new camera. Slide me over a piece, i am all for toffee time! The toffee looks delicious and your photos are great. Looks like the new camera is working out quite well. Your photos are amazing. Can you send me a piece of toffee please? (KIDDING!!) The toffee looks YUMMY. You don’t use a candy thermostat? Great pictures with your new camera! And the toffee looks delish! That looks fantastic! Beautiful photos too. That looks great! 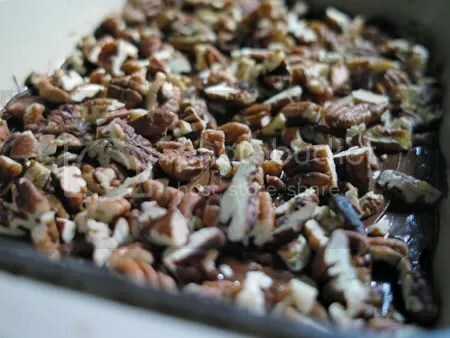 Pecans are my favorite for toffee, and it looks like that’s what you used. Delicious! GREAT PHOTOS! That toffee looks delicious! ooh justin – your toffee looks perfect! I love snacks like that! Easy and delicious! Congrats on the new camera, the photos look great! seriously… this makes my heart melt… yummm!!!! toffee is the best, and nothing beats the homemade kind! gaby: ha, I know… i used to buy toffee like this, but now I can make it at home since I know the tricks to making the candy. 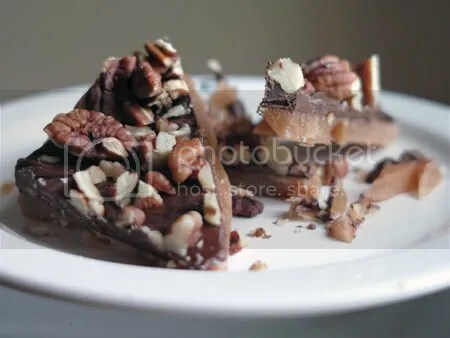 It takes awesome pics and that toffee looks so good. All those nuts and chocolate. I think i am going to have to make it. Oh yum! I made something like this once. Yours looks so delicious! What a fun way to experiment with your new camera. These look great. Love the pictures, the pictures just make me want it all the more… slurp! Patience — what’s that? I need this *now*. I’m usually too lazy to make something that has multiple layers, but this looks easy enough. Very cool camera, that Sigma DP2. Beautiful photos!! bunny: hi, and thanksleela: yeah, i’m not the most patient person either, but these are worth itGG Merkel: It’s a Sigma DP2 — just came out a week or two ago. thanks for visiting.christina: oh, you know about it? it’s super new, but of course it’s similar to the dp1, but it seems like they tweaked some of the things that were wrong with it when they made the new model. it’s an interesting camera, probably not for everyone though… with a fixed lens. ohhh. that sounds just delicious! i love toffee. i think i’d have a hard time letting it cool off first!! i know, heather, it’s very tough to wait, but they’re so much better once the chocolate has set. heather: actually I had to wait close to 2 months from when I first heard about this camera until it hit stores. on chat boards there were people who had been anticipating the release for longer than that, so I was almost lucky. and it seems like a lot of good stuff goes out of stock once it releases — i know we’re in a recession, but it hardly seems like it sometimes. 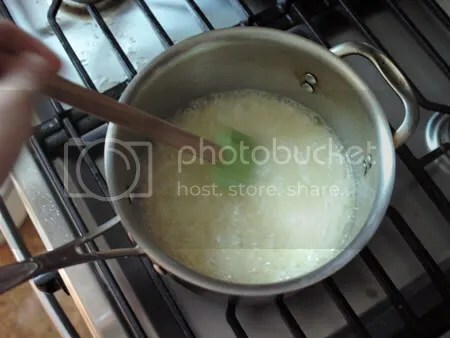 heather: I forgot to say that it actually just fell right out of the pan, but I did grease it with butter before I poured in the candy layer. I don’t know which I’m coveting more: the toffee or the camera. Both! I’ve made homemade caramel before so I definitely have the patience to make this, especially if it turns out as delicious-looking as this. tangled noodle: right, this must be similar to making caramel, except of course that the caramel stays soft and this gets very hard. thanks for commenting so much today. OMG that looks amazing, I freaking love toffee! Trying out a new camera, what a great excuse to make a decadent treat! Maybe I should buy a new camera too … This looks delicious and cavity-worthy! Wow, those look amazing! I love toffee, these are definitely going on my to make list! Ooh the toffee looks delicious! And you've somehow managed to make it look 'bakeable' and not something to be afraid of :PI'm super late, but congratulations on the camera! I've been dying to get a new one! That toffee looks perfect – indulgence at its best!